Harvard Kennedy School professor Graham T. Allison listens to U.S. Department of Energy Official Carol Dumaine speak as part of the Center for the Environment’s ongoing Green Conversations series. A U.S. Department of Energy official presented a federal initiative to help unite policies on energy and the environment and matters of national security yesterday, in a talk arranged by the Harvard University Center for the Environment. 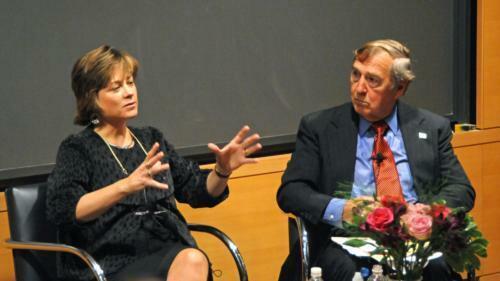 Carol Dumaine, the department of energy’s deputy director for energy and environmental security, stressed the need for the government to “democratize strategic intelligence.” Her goal, she said, was an interdisciplinary approach that would bring awareness of threats stemming from issues such as climate change, water shortages, and natural disasters to those working to improve national security. Following her presentation, Dumaine participated in a panel discussion with Graham T. Allison, a professor at the the Harvard Kennedy School and Daniel P. Schrag, an earth and planetary sciences professor and HUCE director. The panel was the third in a series of “Green Conversations” held at HUCE. Three or four more are set to be staged in the spring. “The fact that [Dumaine] exists is fascinating and very encouraging,” Schrag said, indicating that the deputy director’s awareness that the environment potentially “poses a huge risk” to the nation’s security was a rare trait. Despite her background in intelligence, Dumaine said that she is not interested in encouraging clandestine research when it comes to national security and the environment. Instead of hiding, Dumaine’s approach seeks to “illuminate uncertainty” for study, allowing for a better academic understanding of national security threats present and future, she said. Dumaine pointed to the importance of collaboration as well as transparency, saying she wants to bring many different ideas together in what she described as an “ecosystem” of ideas that will encourage innovation. Its ambitious goals aside, the interdisciplinary program is still just a “seedling,” Dumaine said. So far three conferences have been held on the subject: one in Scotland, one at the Italian Embassy in the U.S., and one in Washington, D.C. Audience members appeared receptive to Dumaine’s collaborative strategies. “This is the kind of cross disciplinary speaker they should bring on,” said Beth Chalechi, a recent graduate of the Fletcher School of Law at Tufts University.